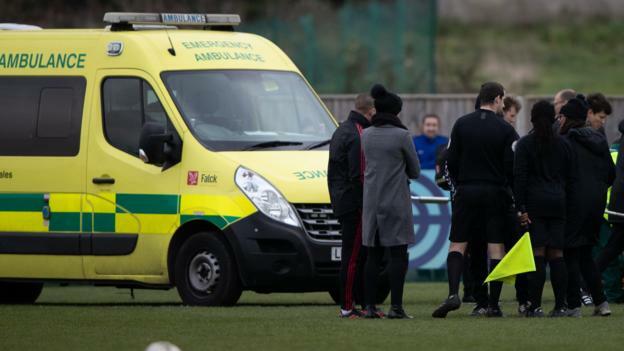 Charlton Athletic’s Charlotte Kerr has left hospital after suffering a rib injury that led to Sunday’s Women’s Championship match against Manchester United being abandoned. Winger Kerr was involved in a collision as Charlie Devlin scored to put United 1-0 up on 11 minutes at The Oakwood. After a delay of almost an hour, with both teams sent back to the changing rooms, the referee called the game off. The Addicks said on Monday that Kerr’s ribs and sternum were badly bruised. “After the results of a scan Charlotte has now left hospital,” a club statement said. “She will now be treated by Charlton’s medical team who will assist her recovery. “[Our] team club doctor, medical teams from Charlton, Manchester United Women and the ambulance service were able to prevent a serious incident from becoming a lot worse and the club would like to thank everyone who assisted. The FA said on Sunday: “Everyone at the FA wishes Charlotte Kerr a full and speedy recovery following an injury during the match today between Charlton and Manchester United Women. Sunday’s abandonment is the second time in six months that Manchester United have had a game called off through injury. A pre-season friendly against Liverpool in July was also abandoned after a neck injury to United and England goalkeeper Siobhan Chamberlain.